SEO strategies are constantly changing in an effort to keep up with Google’s latest algorithm release (the formula Google uses to serve you the most relevant search results based on your query). 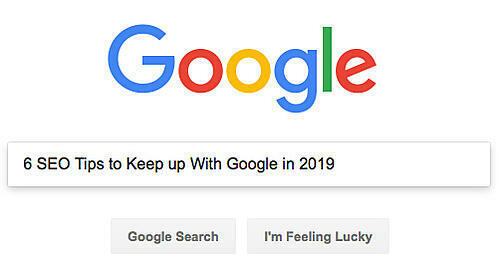 Each year, Google changes their algorithm 500 to 600 times to ensure they’re staying on the edge of innovation and continuously improving their search experience for users. While only a few of these “updates” implement major changes that are immediately obvious to marketers, it’s still important to stay on top of the latest optimization efforts to improve your website’s visibility. For industrial manufacturing companies in the B2B sector looking to improve your site’s ranking in 2019, read below to access our top tips for improving your search engine results in the new year. The main reason the vast majority of people use Google as their default search engine is because of the high-quality search results Google provides. But how does Google serve up such accurate results? The short answer is: crawlers. Crawlers are essentially AI-enabled robots (artificial intelligence, that is) that scan websites and assess their content. They look for websites, blogs, and other forms of content that have the most relevant answers for a given search term, and then use that information to populate those websites into the SERP (search engine results page). Part of what the algorithm takes into account is your “authority” on a given subject. The website with the best information will rank first—reaffirming how important your site’s content is at influencing your SERP ranking … and your prospects! To achieve those elusive top rankings, you’ll need to do research and develop targeted content that provides detailed information and helpful answers to questions and key phrases relevant to what your ideal customer might be looking for. If you’re unsure of the keyword phrases that are important to your prospects and customers, try running a keyword analysis on your website with a software tool such as MOZ. Once keywords are established, map out an inbound marketing strategy that includes creating a content plan—blogs, social media, videos, etc.—for each of the distinguished topics, making sure each one is addressed with authority. The more comprehensive and organized your inbound marketing content is, the greater the likelihood your website’s ranking will be favorable on the SERP. High on your list for improvements this year: optimizing your user interface (UI) and user experience (UX). The reasoning behind this is that Google Analytics uses metrics to evaluate website quality, and you guessed it, then factors that score into their SERP ranking algorithm. By far the most important variable in a website quality analysis, other than content, will be your site’s user experience/interface. Essentially, if your site is difficult to use (and some can be downright frustrating to surf around and get quick, helpful content on), why would Google want to promote it? Take advantage of white space on your pages. Use attractive calls to action. Utilizes images (but don’t overload; and be sure they are files sized at low enough resolution to minimize download speed). Separate key information with bullet points. Include well-designed and creative headlines. Catch your 404 (page cannot be found) errors; this may indicate a “dead” link, incorrectly written URL, or unresponsive server, among other reasons. Be responsive (aka mobile friendly). In one of the most recent search engine algorithm updates, major changes were implemented that no longer prioritize stand-alone keywords, and instead show a preference for clusters of content built around specific topics. This is known as contextual or semantic search. 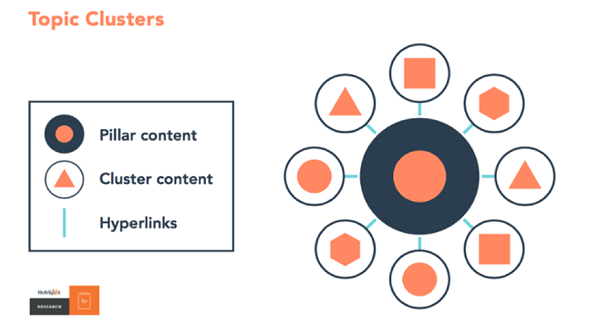 What that requires when planning your content creation is having topic clusters, which fundamentally changes the structure of your site’s content—at least behind the scenes. To better position your company to be found through contextual search, the content “architecture” needs to link together in a very thoughtful approach, forming clusters around pillars (topics) relating to specific categories of your business. To break it down, pillars or “pillar pages” are pages on your site, each with the purpose of broadly defining a topic in the most comprehensive manner possible. This page will serve as the anchor for your authority on a given topic. The clusters are content pages (other web pages or blogs) that support the pillar pages by focusing on long-tail keyword phrases, which explain a specific aspect of the pillar topic in more granular detail. Finally, you must connect the content together to form a searchable, related cluster by hyperlinking the pillar pages out to the cluster content and vice versa. The interconnectivity of your topic cluster content will signal to search engines that you’re an expert within the category and likely deserve a high ranking on the given topic. It shouldn’t be news to you that mobile users have drastically changed the SEO arena the past few years. In fact, search traffic from mobile devices has actually over taken traffic from desktop devices. To respond to this increase in mobile activity, Google has placed increasing emphasis on analyzing the mobile version of your site to serve up search results. So, if you don’t have a mobile-optimized version of your website, you’re about to fall way behind your competition in 2019. If your company doesn’t have a mobile version of your website, design one immediately. Use mobile plugins on popular CMS platforms (Wordpress, Joomla, or Drupal). Improve your site’s loading times. Redesign your pop-ups for mobile devices. Enable accelerated mobile pages (AMPs). In 2018, we saw how voice recognition and voice search have become an integral part of daily internet use. This rise in voice search is only expected to continue with smart devices such as Google Assistant, Siri, Alexa, and Cortana becoming more pervasive. For 2019, these devices will see major technological advancements that will further place voice search optimization as a priority focus in SEO. The best advice to keep up with the voice search craze (not to be confused with a trend, because it’s pretty much here to stay), is to create more conversational content. What does this mean? Well, when people search using their voice, they are far more likely to use language they’d normally use in a conversation with another human being. This means that placing emphasis on simple keywords will be far less effective than optimizing content towards long-tail keyword phrases. Think about it, would you speak to another human in terms of “Hiking shoes cold weather,” or would you ask them, “What are the best hiking shoes for cold weather?” To better cater your content to voice searches, think of the phrasing people use when asking questions to your sales personnel about your product or service. Often these FAQs will serve well as the phrases that will help your business get found in the era of voice search. Security plays a huge role in the ranking of your site on the SERP. Let’s face it, it wouldn’t be a good look for Google to serve up a top ranking that has malicious software or viruses—let alone the danger they could create for visitors. To ensure they don’t put harmful websites in the top-ranking spots of a search, Google places a massive preference on sites that have a Secure Socket Layer (SSL) Security Certificate. All other things equal, a site with an SSL certificate will earn a higher result than an identical site without the added security. An SSL Certificate is comprised of small data files that are installed into a web server as a precautionary protective blanket against unwanted threats that could damage a website. It also allows your website to create a completely secure connection between a web server and a browser. Typically, SSL is used to create secure credit card transactions, data transfers, and login information. Getting an SSL Certificate for your website is truly a no brainer regardless of the SEO value it provides—bottom line is that a safer website is a better website. If you need help implementing any of the best practices outlined above, Grant Marketing is your resource. As a full-service marketing agency—with capabilities including SEO, content creation, account-based and inbound marketing for manufacturers, brand development, website design, and more—we can help guide you through the process of implementing your new search engine optimization tactics. Contact us today and take the first step towards increasing your website’s visibility online. Have questions about your own site and how this applies to you? Click the button below and fill out our brief survey to receive a Free Website Assessment. We’ll tell you exactly what areas your site is doing well in, and where it could improve.